Big power and Bluetooth connectivity. 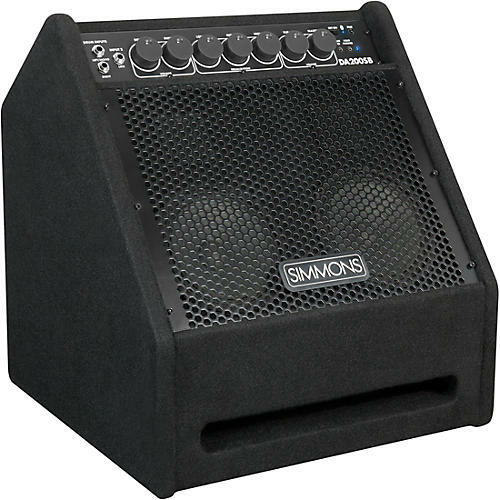 The Simmons DA200SB electronic amplifier combines the power of 200 watts with advanced connectivity and tonal control, ideal when playing with loud bands or in larger playing venues. With its seamless Bluetooth connectivity, you can wirelessly stream audio from your smartphone, tablet or computer. The DA200SB’s speaker configuration includes a massive 12” down-firing sub (with volume control), two 6.5” midrange speakers, and two tweeters, resulting in superior reproduction of all the details and dynamics of electronic drum sounds. The built-in 3-band EQ provides precise sonic customization to match the venue or performance situation. And the DA200SB’s slanted cab design helps direct all that great sound toward the drummer, allowing the player to hear themselves clearly during practice and rehearsals. Output options include dual speaker outs and dual XLR direct outs to mixers and other audio gear.